It’s a story touched with humor, a story that shows the humanity of the Benedictine monks who call Saint Meinrad Archabbey in St. Meinrad their home. One of the long-standing traditions of the archabbey in southern Indiana involves the church bells that call the monks to prayer, bells that are rung manually by the novices—men who are in formation to become monks. As the story goes, a novice tried to ring the bells one morning, but no sound came from them. Further frantic efforts to ring the bells by the suddenly-panicking novice provided the same results. Finally, it was discovered that the hammers of the bells had been cushioned and wrapped in duct tape. The person—or persons—responsible for the prank remains a mystery years later. 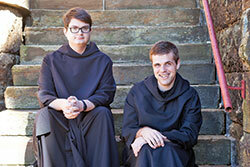 But the way that story was shared recently—in a podcast hosted regularly by two monks—shows how Saint Meinrad Archabbey is using social media to help unveil the mystery and the stereotypes surrounding the 90 monks who live together there. There’s Benedictine Brother Joel Blaize, the 30-year-old with the smooth voice whose hobbies include reading, riding his bike, writing music and playing the French horn and the penny whistle. Neither of them knew they were even auditioning as hosts for the podcasts when they were interviewed for a potential future segment in the summer of 2015 by Benedictine Brother William Sprauer and Krista Hall, the two driving forces behind the podcast. “We did the interview together, we get along well, and there was a lot of laughing and joking,” Brother Kolbe recalls. The connection was so good that they were offered the opportunity to host the podcast. And while there’s a lot of laughing, joking, storytelling and sharing knowledge about the monastic life in the episodes, the true connection they’re always seeking is to help their listeners—and themselves—move closer to God. “That’s our number one goal—to help people seek God, to get to know him,” Brother Joel says. “Really, our whole life is built around our search for God. To give people a glimpse of how we do that, too, maybe it will inspire them to do the same thing. Other episodes include insights about a day in the life of a monk, the way monks celebrate Halloween, the tradition of monastic music, the importance of bells to monastic life, and the different hobbies and interests of the monks. That last episode included Brother Simon talking about his beekeeping hobby, Brother John Mark playing the cello, and a band of brothers discussing their beer-making efforts. It’s all part of drawing listeners into the essence of community life for the monks of Saint Meinrad—a way of life and searching for God that is now being conveyed through two young men who once never imagined themselves being monks at a monastery in southern Indiana. That lost feeling led him to explore the Catholic faith, and he found a home in it when he was received into the full communion of the Church in 2011. From there, he entered Saint Meinrad Seminary and School of Theology with thoughts of becoming a priest, but he felt more drawn to the life of prayer and community that the Benedictine monks offered. Brother Kolbe grew up Catholic in a home right next to his church in a small town in Michigan. As a young adult, he had a job he loved, co-workers who were friends, and a family support system that brought him joy. Yet he felt restless and began praying to God for an answer to relieve that feeling. A short while later, his sister, Sister of Mercy Maria Faustina, called and told him that she and her fellow religious sisters thought the time was right for him to consider life in a Benedictine community. Never mind that he didn’t know anything about the Benedictines. Still, he eventually made a visit to Saint Meinrad. While that time didn’t create an immediate connection, it was enough to make him return for more visits. Finally, he entered the community as a novice in 2015. Not that their lives there are ideal, they say. They both acknowledge they are similar to most Christians in that they face rough times in their journeys of faith. “We do come here to seek God,” Brother Joel says. “The Rule of St. Benedict says that the monastery is a school of the Lord’s service. One of our monks says it’s a school from which you never graduate. I can identify with people who struggle with their faith. In an intriguing way, hosting the podcast has added joy to the production of the episodes and the search for God. He laughs before he turns serious.